It was inevitable that as a teenager I would wear so much black because in my life until that point I was strictly forbidden to. Like wearing makeup, wearing black was something that my mother simply did not allow until I was a teenager. While I understood her stance on makeup and I didn’t choose to push back on that front, the whole wearing black thing was something else entirely. Black was the colour all of my all my favourite bands and of fashion. All the people I wanted to know and be known by wore black. (A brief note: I know true black not technically a colour, but the absence of it. But for the purpose of this piece I’m going to call it one.) But there would be no black clothing for me. Not until I was a teenager, and even then if I wanted black clothes I had to make them or pay for them with my babysitting money. The worst was when my mother tried to dissuade me from my love of black clothes and instead nudge me towards navy blue, black’s arch nemesis and the colour of middle age. There was no way. She tried to tell me it wasn’t that different, but we both knew it was. Black was cool. Navy was most definitely not. There was nothing my mother could have said or done that would have stopped me from wearing black at 13. By the time I was 14 there were black pants, black skirts, black tops and sweaters throughout my wardrobe and I loved it all. The year I was 15 I wore almost exclusively black, head-to-toe. My mother would suggest a I wear just I little bit of colour to brighten it up, but I would just scowl. It was that kind of year. 1. Tannery West, Vogue, September 1984. Photograph by Albert Watson. 2. Gianni Versace, Vogue, September 1987. 3. Gilles Bensimon for Elle, June 1988. 4. Guy Bourdin for Vogue, December 1986. Clothing by Claude Montana. 5. Alfred Sung, Toronto Life Fashion, October 1987. 6. 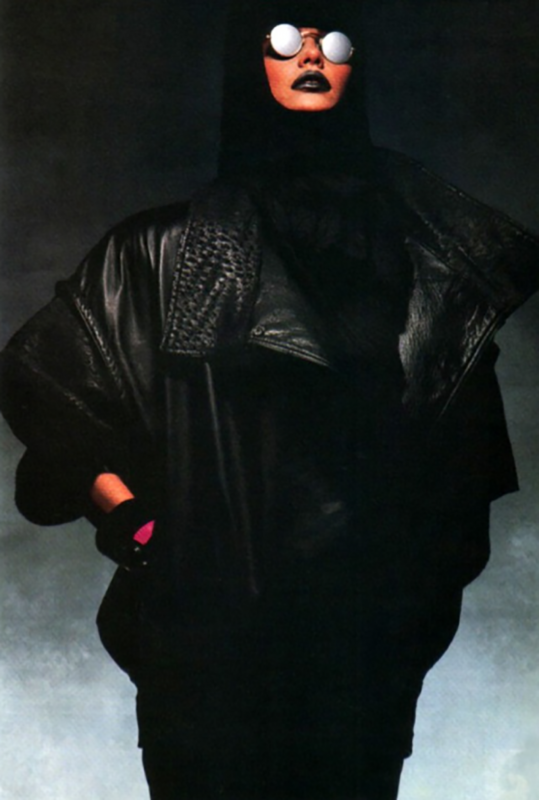 Michael Hoban/North Beach Leather, Vogue, October 1987. Photograph by Herb Ritts. 7. Kiskissay/Saks Fifth Avenue, Details, November 1987. 8. Chanel, Harper’s Bazaar, September 1988. 9. Byblos, Harper’s Bazaar, September 1986. Photograph by Javier Vallhonrat. Your mother’s anti-black stance was most certainly strange indeed. I’ve literally never heard of even the strictest of parents forbidding their children to wear black. Have you ever figured out what was the point behind it? It actually wasn’t so strange in the 1970s and early ’80s when I was a kid. At least not in my neighbourhood in Calgary. With the exception of some formal-wear (like little black suits for boys and prissy velvet dresses for girls) shops simply didn’t carry many black clothes in kids’ sizes. Looking back through all of my elementary school class photos not a single girl is wearing anything black but shoes. Availability was an issue until you could fit into junior or adult women’s sizes, but my mother also felt that all-black was too sophisticated/mature for children. It was a totally different time for sure, compared to the racks and racks of black kids’ clothes now, and I think the attitudes have changed along with the availability (including my mother’s).